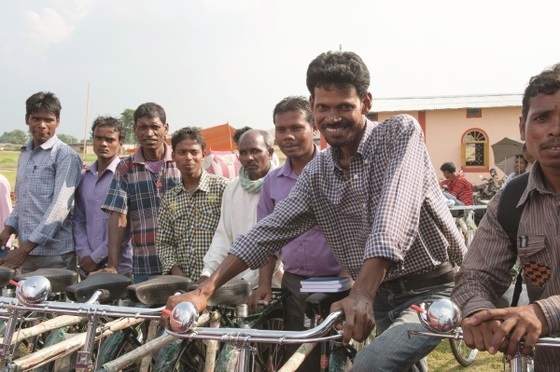 Just like Nishat received a bicycle through a GFA-supported Christmas gift distribution, these men have also received bicycles! For those whose only other option may be walking to find work, a bicycle provides tremendous opportunities for better employment. The prayers and support of men and women like you have enabled many to receive these life-changing gifts. Thank you! Nishat struggled to provide for his family. He worked hard every day he could, but as a day laborer, he struggled to find consistent work. That meant he often wasted precious time and energy walking around his community, just looking for someone to hire him. When Nishat did find someone, he’d often have to walk even farther to the job site. The more time he spent walking, the less time he spent working, and the more tired he was by the time he got to work as well, but what could a poor laborer do? Meanwhile, Pastor Bhupad, along with his wife, had started a Sunday school not far from where Nishat lived, so Nishat and his wife decided to start sending two of their three children there. Nishat’s children started learning stories from the Bible, singing action songs and even memorizing some Scripture verses, all of which they enjoyed very much. Over the next year, Pastor Bhupad and Nishat developed a good relationship. Pastor Bhupad saw how hard Nishat worked and how, despite his efforts and labor, his family continued to struggle financially. As Pastor Bhupad remembered his own days without a bicycle, he realized a bicycle would be a tremendous blessing for Nishat as well. That’s why, when the pastor had the opportunity to host a Christmas gift distribution in his area, he wanted to give a bicycle to Nishat, a gift that could change this father’s life. Bicycles given through GFA go to pastors, missionaries and others who could benefit from such a gift. Just like other Christmas gifts, bicycles have changed the lives of many recipients over the years and pointed many to the greatest gift Christ offers. With his new bicycle, Nishat can find work faster, which saves him time and energy he would have wasted walking before. His children are happy to be able to attend the Sunday school, where they are memorizing Scripture and experiencing Jesus’ love, a love they are sharing with their parents, as is Pastor Bhupad.